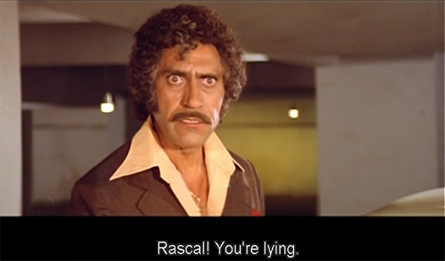 We begin with wealthy bad guy Rakka (Amrish Puri). Poor Decision #1: Amrish agrees to wear an Afro wig (or a bad perm, whichever). He is one big horrible bundle of badness. He stole all his riches from a former lover, Princess Jwala (Aruna Irani); her brother Vikram (a young but still incredibly repulsive Shakti Kapoor) is in prison, courtesy also of Rakka. Jwala and Vikram are bent on vengeance and recovering their family fortune. 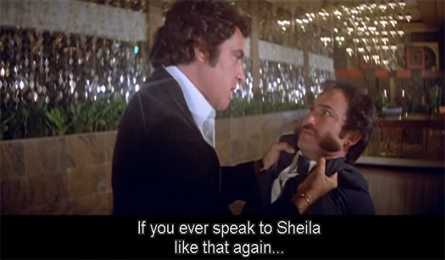 After beating up a blind beggar (just to reinforce his badness), Rakka has a run-in with charming Rajesh (Feroz Khan), a jewel thief extraordinaire and lover of nightclub singer Sheila (Zeenat Aman). 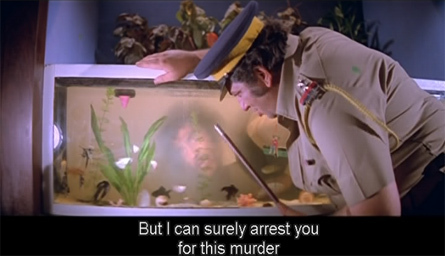 Sheila loves Rajesh, but disapproves of his life style; naturally she is very unhappy when police inspector Amjad Khan (Amjad Khan!—in a very tongue-in-cheek performance) catches him after a robbery and puts him in jail for a few years. She waits faithfully for him, though, in spite of meeting a very nice young man named Amar (Vinod Khanna) with a cute little daughter named Tina (Baby Natasha Chopra). Amar is a thief also, who had worked for Rakka until Rakka’s ruthlessness led him to quit (in spite of both Rajesh and Amar being criminals, we know they are really nice guys since they stick up for the poor and defend the downtrodden). He is devoted to his daughter. Sheila quickly befriends Tina and Amar, but even as he falls in love with her she manages to keep him at arm’s length. Poor Decision #3: I am bewildered by Sheila choosing Rajesh over Amar (see above, and below). My sister is too. Interestingly, there is an unusually wasted opportunity to weave the story of Tina’s absent mother into the fabric of the plot—but it goes unused, and we never do find out where she is or what happened to her. Off the top of my head I can think of half a dozen ways it could have further promoted our hatred of the bad guys, our sympathy for Amar, or otherwise further complicated things. Does the fact that I even ponder this perhaps mean that I watch too many Hindi movies…? Then Rajesh is released from jail. Amjad Khan is waiting and we understand that he is going to be keeping a close eye on Rajesh. Sheila arrives on a motorbike to take Rajesh home. There are some goons waiting for him there, and he is forced to go with them to meet Jwala and her brother (who is now out of jail too). They tell Rajesh that they will give him 500,000 Rs to steal their jewels back from Rakka. He is reluctant, since he’s promised Sheila that he’ll go straight; Vikram makes him take a 50,000 Rs advance and “urges” him to consider it. 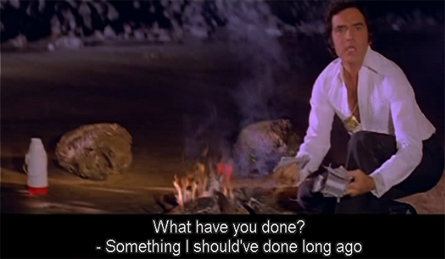 Poor Decision #4: When Sheila finds the 50,000 in Rajesh’s pocket she throws it in the fire. Now he can’t return it to the Singhs. He is pretty much stuck between a rock and a hard place. One day, Vikram stops his car in the middle of the road in order to threaten Rajesh. Amar drives up behind and wants him to move his car out of the way. Poor Decision #5: Vikram picks a fight with Amar, who thrashes him and destroys his car in the process (see windshield below, for instance). Poor Decision #6: and pulls a gun on Amar. At this, Rajesh stops looking on in amusement, and comes to Amar’s rescue. They send Vikram packing, and a friendship is duly formed. Amar gives Rajesh a ride home—to Sheila’s, and the light dawns. He realizes that she loves Rajesh, and when she pretends not to know him (fearing Rajesh will be angry—why is she with him, why???? ), he goes along with it and even later tells Tina not to give the game away. Of course, Vikram is not going to let his humiliation at the hands of Amar go by unanswered, and one night he sends his goons to get Amar. He ties Amar to a tree and beats him mercilessly, breaking his legs and almost killing him. Luckily, Rajesh arrives just in time to save Amar. He takes him to the hospital, where he spends night and day nursing Amar back to health. Vikram’s next ploy is to kidnap Tina as she is playing outside with her dog. When Amar discovers that Tina is missing, he knows it is Vikram’s doing. Rajesh comes up with a plan: they will steal the family’s jewels from Rakka for Vikram and Jwala, and Rajesh will allow himself to be caught by Inspector Khan, who has been following him around. He will do the year’s jail time for burglary; meanwhile Amar can take Tina and Sheila to the UK where they will all be safe and Rajesh will join them on his release. Amar agrees unwillingly—he would rather do the jail time himself—but Rajesh convinces him for Tina’s sake to go along. They get Tina back from Vikram and Jwala based on their promise to make things even with Rakka; what they don’t know is that Vikram and Jwala are plotting to kill Rakka and frame them for it. It works! Poor Decision #7: Rajesh believes Inspector Khan when he tells Rajesh that Amar planned the frameup in order to escape with the jewels and Sheila too. He escapes from custody and goes to England to avenge himself on Amar, with Khan hot on his heels. How many more Poor Decisions will be made? Can Amar convince Rajesh of the truth? What about Vikram and Jwala—do they get their comeuppance? Will Inspector Khan arrive in time? Who will Sheila choose in the end? For all the predictable answers—see Qurbani. Posted on March 17, 2008 at 10:50 am in Hindi movies	| RSS feed You can skip to the end and leave a reply. The kid is surprisingly non-annoying! All I do remember of the film is the song “laila oh laila” and the scene between Amar and Sheila on the beach, where you can palpably feel his longing. I didn’t really talk about the songs, but I liked them—especially “Laila Oh Laila”…and I know Feroz Khan directed the film etc. and so had to be the hero…and I did love the scene where he wrecked Rakka’s car, hilarious :-) But *Vinod Khanna*…just so much more worthy. Yes, happens in Hollywood too (e.g. Jack Nicholson, Sean Connery)—they get older as their co-stars get younger. I just read somewhere that Sonam Kapoor is going to act opposite SRK in Adi Chopra’s next film. Urgh. I really oughta see this movie for the Vinod factor. I also hear it has buddypyaari and of course! Aap Jaise Koi – the most discotastic Bollytune I’ve ever listened to. Bless you Zeenat. And thanks to this review, I will now also be curious about Amjad Khan in this. One and true villain, that guy. Agree with you whole-heartedly on Amjad, and wholer-heartedly on Zeenat. She had so much class. Sighh. Back to work. Two bits from me. 1. The song ‘Aap Jaisa Koi’ was composed by Biddu Appiah, while Kalyanji-Anandji scored the others. Biddu (IMO) adapted it from ‘Dance Little Lady Dance’, by Tina Charles, for whom he was the producer. It is not a direct adaptation, but the similarities are there. 2. Feroz Khan, in the middle of the passionate ‘Kya Dekhte Ho’ rips out a young tree planted by his props department. Rewind to 1972’s ‘Apradh’ and you will find him doing the same thing in one of the songs. Guess environment takes a back seat when testosterone levels go high. I thought Tina was Urmila Matondkar as a child. I was struck by the resemblance and when I checked the credits, sure enough, there was a ‘Baby Urmila’. Are you sure it is Natasha Chopra? Hmmm…she’s credited on imdb as being played by Natasha Chopra, but imdb is not always reliable. I don’t remember thinking she looked like Urmila, but you might be right! no the girl is not urmila,she is natasha chopra she was cute wonder why she never acted in any other movie.this is the best movie acted directed by feroz khan,another must see dharmatma. I love Dharmatma, much more than this :) Thanks for confirming that it’s Natasha too! I don’t know anything about her…it’s sadly hard to find out information like that. But maybe someone will see this and know! Qurbani = Bollywood’s “The Big Lebowski”. Completely agree with you memsaab, Hindi film music in the 80s was atrocious. I’ve heard that filmgoers in that era used to take their tea/ washroom breaks when the songs were on. The 80s is considered to be worst decade in the annals of Hindi cinema. but have u heard from any sources that feroz khan offered the role of amar to amitabh bachchan? Please please tell me who the black guy is in Laila oh Laila, who keeps on winking and saying aha!!! Please!! I have been trying to place this extra actor for years :( :( :( I think You’ll understand the need to identify one of those faces that get stuck in your head since you happen to love a particular scene/song. Thanks and btw great comic book style writeup on JKK . This was a typical Feroz Khan movie. That means it was a lot of style with lots of opportunity for glamour and practically no substance in the plot. 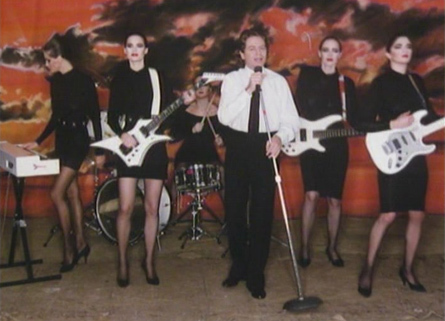 Where he hit the jackpot with this one was the music. Not only did Kalyanji-Anandji gave one of their best scores (they gave some of the best racy, westernised music of the 70s, anyways) but Biddu created a legend with Aap Jaisa Koi and Nazia Hassan. We know you don’t like Indian Disco but this one is an exception! Spot on Siddhartha. Qurbani was all style and no substance. Qurbani has become a classic legend in the cinematic history of India. I remember when I had thought I should blog, I had discovered your blog…I am glad to see your love for Indian movies has continued (unlike my blogging ;)) And since you mention Vinod Khanna, have you seen Rahul Khanna? Thanks for this, funnily done! Well, my blogging hasn’t really continued very well :D but my love for Indian movies always will I hope. Yes, Rahul Khanna is quite wonderful! feroz khan ‘s movie were stylish . i remember his brother sanjay khan who came on radio said they had 40 helpers in their house. it just shows how rich the family was. one can see mrs. feroz khan in aap jaisa koi meri zindagi mai aaye in girls band. i learnt it from javed jaafery show when he was showing qurbani.